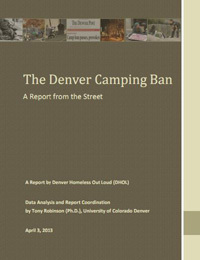 In collaboration with the Denver Homeless Out Loud (DHOL) community group, Associate Professor Tony Robinson, Ph.D., compiled survey results of 512 homeless individuals regarding the Unauthorized Camping Ban. The 80-page report details the background of the ban, survey results and policy recommendations in the wake of one of the nation’s most severe laws against public homelessness. The Denver City Council passed the ordinance in May 2012 under pressure from members of the downtown business community who argued that the growing number of homeless camping on the 16th Street Mall and Civic Center Park was impacting business and harming the perception of Denver. Robinson and DHOL presented their study to the Denver Homeless Commission and held a press conference at 10 a.m. Wednesday in Denver. 59 percent of respondents said it has become more necessary to avoid police after the ban; 4 percent report police being more helpful. 53 percent said they feel less safe in Denver since the ban; 6 percent feel more safe. 79 percent who used to sleep downtown regularly now avoid the area far more; 69 percent said they now seek more hidden places to sleep at night. 50 percent their sleeping habits have been negatively affected. Though there has been a reduction in outdoors sleeping, the decline is minor. Before the ban, 72 percent of survey respondents said they sometimes or always slept outside in Denver, as compared to 64 percent reporting outdoor sleeping after the ban. No arrests have yet taken place under the ordinance, though citing and arresting people for other code violations and moving homeless people along through oral and written warnings are very common. Camping ban supporters said the ban would improve the quality of life for the homeless by connecting them with health alternatives. Ban enforcement follows a series of steps: 1) determining if there are other violations that the camper should be cited for; 2) issuing the violator an oral warning to quit covering themselves, and/or to “move along”; 3) issuing a written warning; 4) attempting to connect the homeless person to services before arrest. However, the latter step of intervention rarely occurs, the study found. Instead, the ordinance criminalizes activities necessary for survival, without providing alternatives. Space should be designated in Denver that guarantees homeless individuals safe, outdoor places to sleep and engage in other survival activities. This space should be well-lit and accessible to homeless services downtown. Increased funding should be developed for programs that address homelessness, ranging from rapid response services for homeless people in crisis to the development of permanent low-income housing units. Dedicate new revenue streams to the “most under-served unsheltered populations” and to the “most effective” programs in reducing homelessness. The U.S. Interagency Council on Homelessness has singled out these types of law as being cruel and counterproductive, Robinson said. “We know there will be hundreds of homeless out there tonight, so we either turn our heads and pretend they’re not there — being forced to make the impossible choice between shelter or criminality — or we admit the reality and find a clean, safe place where our residents can live with us,” he said.